GoSleepGo is a travel oriented community with thousands of members worldwide that has quickly grown into an information source depended on by young travelers seeking out destination information that ranges from swanky, just-opened restaurants to caves and hiking trails. Users at GoSleepGo are as at home sipping wine at a gallery opening as they are swinging from a rope into a lake. By providing easy to use tools that allow users to map out their pictures, trips, and upcoming adventures, GoSleepGo is dedicated to helping young travelers capture the offline world with online tools. The GoSleepGo Travel Directory provides each user with a personalized profile from where they can share pictures from their explorations, meet new friends and stay in contact with old, and research from or contribute to a personalized database of interesting spots around the globe. The locations database currently contains over 750 user submitted locations, each with detailed information, travel tips, and photographs specific to the area…all written in a casual, personal tone. Unlike many traditional online guides, offering limited and impersonal information scraped from phone books and other sources, the listings at GoSleepGo are fun, in-depth, and convey the same excitement that you would get from a friend telling you about a great new place they’ve discovered. Since the location format is open and original places are encouraged, the submitted locations are some of the most unique destinations online. Often times GoSleepGo serves as the location’s only online presence. Browsing has been simplified with the introduction of our interactive map. All content types on the site can be associated with their GPS coordinates and then plotted geographically according to user defined options. 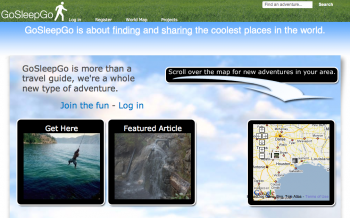 This allows users to browse for exciting new things to do in their town as well as along their road trip. In addition to the locations database, thousands of personal user photographs, blogs, and messages, have been added to the site. Membership and use of the GoSleepGo Travel Directory and Tools is free and is currently accessed by over 700 visitors a day, most of which view multiple pages and areas of the site. Since the sites inception, over half a million users have made use of the Travel Directory and there are currently over 2600 registered users who actively contribute to the site.